Recreating sonic puzzles like Unmap and Repave in a live setting is no small feat, but effortlessly enhancing those soundscapes and creating a visual world for the sound to live and breathe is an astonishing accomplishment. 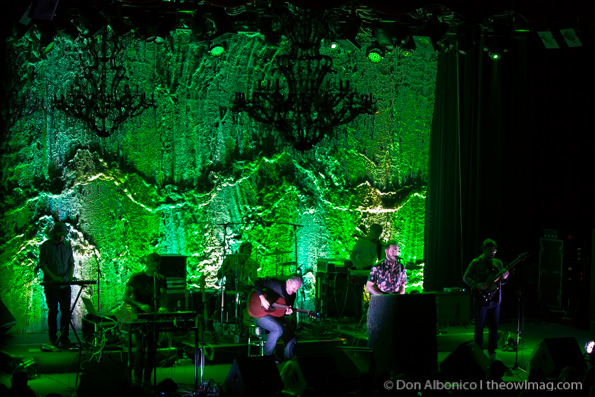 That was what Volcano Choir achieved on Tuesday night at The Fillmore. 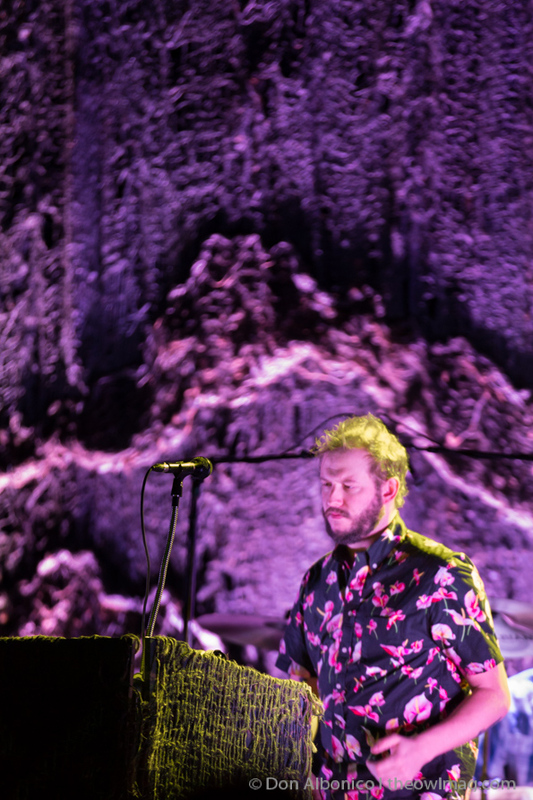 The band harmoniously blended technological aspects with organic components throughout the entire evening, and when you think about it, that is the essence of who Volcano Choir is. Keyboardist and self-proclaimed tech nerd Tom Wincek and guitarist Chris Rosenau are the creative drivers behind Volcano Choir unifying their diametric arrangements to construct an overwhelmingly lovely framework. This marriage of opposites existed everywhere, and if you paid close attention, its subtlety was revealed. As the show opened, the wall of cascading fibrous netting transformed into an uncharted landscape that shifted with beautifully choreographed lighting during “Tiderays.” Rosenau’s delicate opening acoustic guitar riffs quietly coaxed Justin Vernon’s signature falsetto vocals out as drummer Jon Mueller and bassist Matt Skemp rounded out the low-end of the rhythm section. As the crescendo naturally built, everything erupted at the apex with Vernon’s electronically modified vocals slicing through the lush topography formed by his bandmates. Vernon’s vocal delivery was notably sure-footed and deliberate and served to underscore just one of the many distinctions between Volcano Choir and other Vernon-oriented projects. 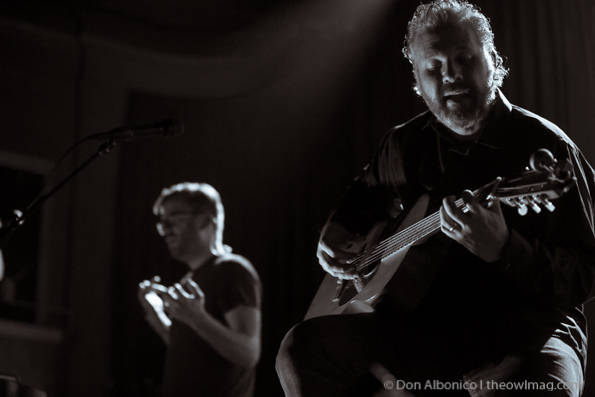 The band’s performance of “Keel” halfway through the set demonstrated Volcano Choir’s ability to deliver a complex piece of music is a deceptively simple manner. Though the instrumentation and arrangement wasn’t particularly complicated, the tricky part was in the mood creation. The simple act of Mueller quietly striking the toms and Wincek manipulating Rosenau’s guitar into a muffled Spanish-style created a cinematic quality through the song’s repetition. From tender quiet moments during the performance of “Alaskans” to the epic rendition of “Still” in the encore that seemed to go on forever, Volcano Choir took us on a complicated journey filled with twists and turns through the landscape and headspace of these seven musicians. 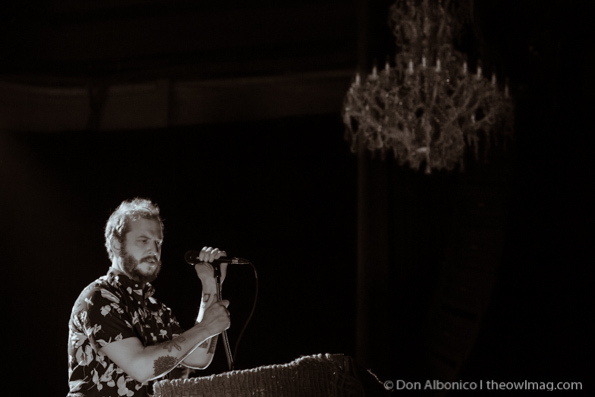 See a full gallery of Volcano Choir’s performance at The Fillmore HERE.